Reptiles and amphibians are among the most threatened species on the planet, yet they have been greatly underrepresented in the conservation community. Think about it… when was the last time you saw an ad or a poster about conservation that included a snake or salamander? The Orianne Society is dedicated to giving reptiles and amphibians a chance to make it through the current biodiversity crisis. We started with the Eastern Indigo Snake, a species that despite being on the endangered species list since the late 1970s, had not received adequate resources to protect and increase the species’ populations. Our initial success with Indigo Snakes led us to realize we could help more species, and we now have three major initiatives (Longleaf Savannas, Appalachian Highlands and Great Northern Forests). There may not seem to be a lot of similarities among these different initiatives. However, we take a very similar approach to each initiative, and tools and techniques developed in one initiative help to inform the others. 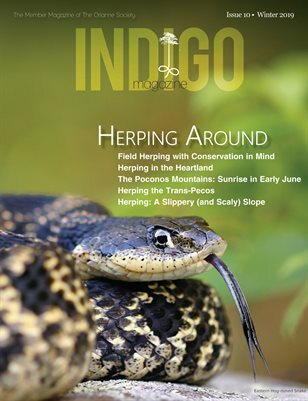 Our work with Indigo Snakes emphasized the importance of a combination of species surveys, habitat management and private land conservation—now we are applying this same framework to all our initiatives. Of course, we can’t accomplish our goals on our own—we need you! This includes support of our efforts. Together, we can bring reptiles and amphibians into the conservation spotlight and help make sure that in the future, we can always discover a snake peeking out of a burrow, a salamander underneath a rock or a turtle crossing in front of us in the woods.